UPDATED: Sun., Aug. 26, 2018, 8:41 a.m.
Rushing: Isaiah Lewis 8-38, Tamarick Pierce 4-26, Dennis Merritt 3-12, Micah Smith 3-9, Gunner Talkington 1-9, Gage Gubrud 1-5, Simon Burkett 4-minus-3, Eric Barriere 5-minus-12, Totals 29-84. Passing: Gunner Talkington 8-11-1 115, Eric Barriere 6-11-2 54, Gage Gubrud 1-2-0 9, Simon Burkett 2-2-0 7, Michael Taras 0-2-0 0. Receiving: Dre’ Sonte Dorton 3-60, Johnny Edwards 2-41, Marques Hampton Jr. 2-30, Isaiah Lewis 1-13, Jayson Williams 1-9, Dennis Merritt 1-9, Kellen Gregory 1-7, Terence Grady 1-4, Tamarick Pierce 1-4, Anthony Stell 1-4, Talolo Limu-Jones 1-4, Micah Smith 1-0, Julian Houston 1-0, Totals 16-185. 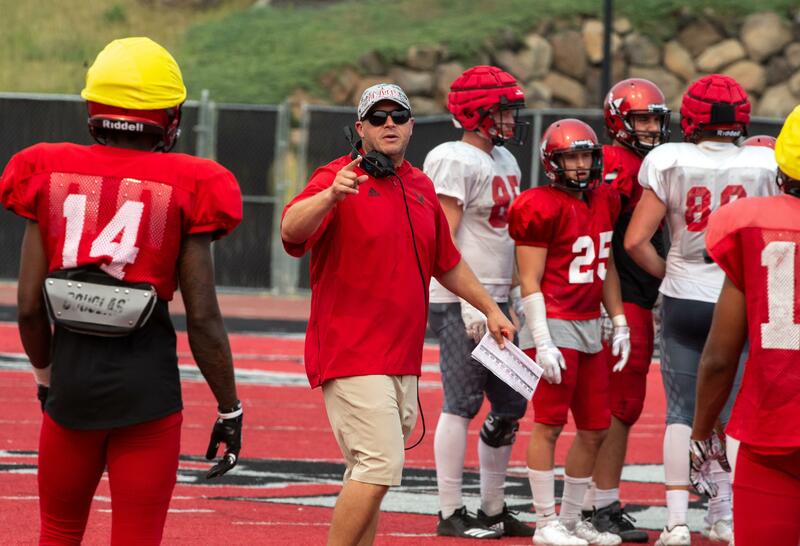 In an effort to shore up one of last season’s major deficiencies – defensive turnovers – Eastern Washington coaches have invoked a three-takeaways-a-practice mandate. In the Eagles’ second and final scrimmage of preseason camp on Saturday, the defense tallied three interceptions, yielded two scoring drives and surrendered just 269 yards. Second- and third-teamers played the overwhelming majority of the 57-play scrimmage. The first-string offense and defense played only a single drive, and about half of the presumed starters for next weekend’s opener against Central Washington were held out. The final day of preseason camp was for evaluating younger, inexperienced players, according to coach Aaron Best. “It’s hard to raise your stock in a second scrimmage when you’ve played thousands of snaps,” Best said of the starters who who weren’t suited up. In All-American quarterback Gage Gubrud’s lone drive, he completed 1 of 2 passes for 9 yards. He found Terence Grady open 25 yards downfield, but Grady dropped the pass, leading to a punt. The defense surrendered just 42 yards in the scrimmage’s first 20 plays, which included a one-handed interception by defensive back Dehonta Hayes on second-string quarterback Eric Barriere. Barriere, who also threw an interception to Kupp, lauded the defense. Third-string quarterback Gunner Talkington had a hand in both of the day’s touchdowns, one a 9-yard keeper and the other a 52-yard pass to Dre’Sonte Dorton. He was also picked off by safety Calin Criner. True freshmen Tre Weed and Isaiah Lewis had nice outings. Weed, a safety, was among four players with a scrimmage-high four tackles. Lewis had a a scrimmage-high 38 yards rushing and also caught a 13-yard pass. Best said he’ll know next week if any true freshmen will suit up in the season opener. Kupp, one of the few presumed starters who played Saturday, said he liked what he saw out of the underclassmen. “You would think more mistakes would happen with younger guys in there, but I think today guys did a good job of knowing what they were doing, and really just flying around,’ Kupp said. The Eagles’ defense, which totaled a meager 13 takeaways in 2017, had six interceptions between the two preseason scrimmages. “We want 30 sacks and 30 turnovers this season,” Kupp said. Published: Aug. 25, 2018, 8:37 p.m. Updated: Aug. 26, 2018, 8:41 a.m.